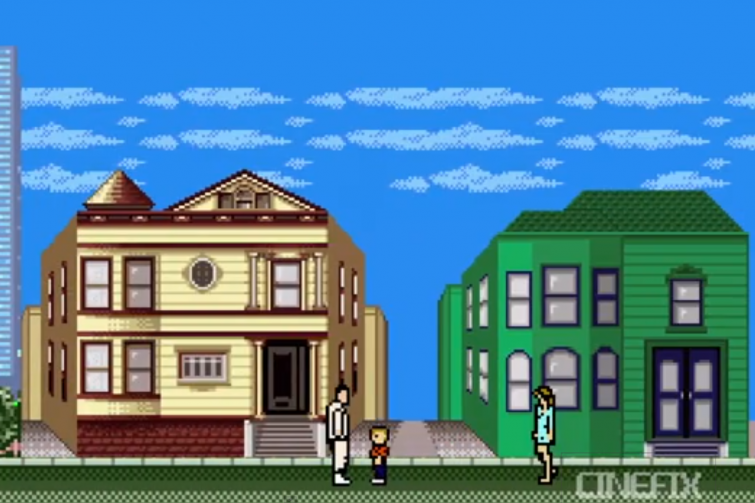 Ever wondered what an 8-bit video game of “Forrest Gump” would look like? Well the folks at CineFix have you covered. The video was developed by CineFix in a series called “8-bit Cinema.” In the series, the producers “gamify” Hollywood Blockbusters into 80’s arcade and Nintendo Entertainment System (NES)-inspired action. Most videos in the “8-bit Cinema” series typically reach over 100,000 views within just a few weeks. Most videos are produced based on requests that fans leave in the comment section. In computer architecture, 8-bit refers to data units that are at most 8 bits wide. 8-bit microprocessor became widely adopted in the 1970s and 80s. The 8-bit style alluded to in these videos are from NES games from the mid 1980s to early 90s. While the videos claim to be 8-bit, most videos produced by CineFix in their “8-bit Cinema” series appear more like 16-bit graphics (think Super Nintendo or Sega Genesis graphics). CineFix published their first entry of “8-bit Cinema” on June 13, 2013 when they produced a 90-second “gamified” version of J.J. Abrams’ 2009 Star Trek. The original video took inspiration from the classic NES franchise “Contra” as well as titles from the space-shooter genre. Most of the video presented graphics more akin to 16-bit video games. Nevertheless, comments poured in for requests for new “gamified” movies.